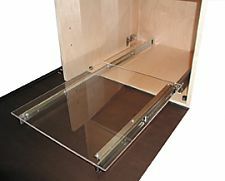 Designed for use with kitchen pantries, computer and entertainment centers, or where a pull-out shelf is needed. This slide features removeable brackets that allow for fast and easy installation. Maximum weight load is 130 pounds. Also features hold-in detent and key-hole style mounting holes. NOTE: Slides only, shelf not included. Recommended Use:Designed for use with kitchen pantries, computer and entertainment centers, or where a pull-out shelf is needed. 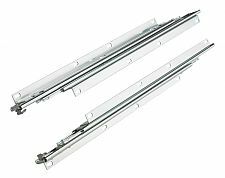 Features: Removable mounting brackets, hold-in detent and key-hole style mounting holes.